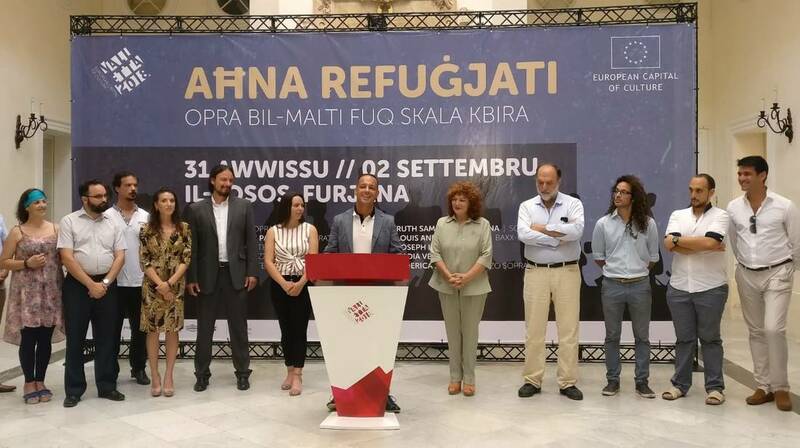 On the 31st of August and the 2nd of September, The Granaries in Floriana will see Valletta 2018’s new, original opera scripted and staged entirely in Maltese: Aħna Refuġjati. The opera addresses timely concerns in the Euro-Mediterranean region, the human cost of large-scale immigration and the universal theme of loss as a result of political convenience, racism and prejudice. The stellar line-up includes highly-acclaimed local and international artists, with soprano Miriam Gauci, counter-tenor José Hernàndez Pastor, tenor Joseph Zammit and mezzo-sopranos Clare Ghigo and Federica Falzon in the leading roles. Gauci and Pastor will be in the roles of parents Shari and Eleja, while Zammit, Ghigo and Falzon will play Hamid, Saja and Darit, the couple’s three children. The cast also includes tenor Nico Darmanin in the role of Karl, a young volunteer; sopranos Ruth Sammut Casingena and Nadia Vella, in the roles of Fatima and Diva, bass-baritone Louis Andrew Cassar in the role of Mirani, an activist, and baritone Joseph Lia in the role of an officer. The opera, composed by Mario Sammut and Richard Merill Brown, under the musical direction of Richard Merrill Brown and the direction of Mario Philip Azzopardi, is Sammut’s first operatic venture after working on multiple international and local projects. Aħna Refuġjati recounts the story of Eleja, his wife Shari, and their three children aged 20, 18 and 10, who flee from their war-torn village in Syria after witnessing atrocities during the civil war, in hopes of a better life in Europe. The opera follows the family’s struggles with crossing borders, the lack of basic human rights, racism, separation and loss, on a journey motivated by hope. Although the opera is entirely in Maltese, it includes surtitles in English as well as in Maltese. Aħna Refuġjati will be held on the 31st of August and on the 2nd of September at 21.00, at the Granaries in Floriana. To book your tickets visit tickets.valletta2018.org. Tickets purchased before the 31st of July 2018 will enter the ticket holder into a draw to win an iPhone X, when using promo code VALIPHONEX at checkout. For more information visit valletta2018.org. Terms and conditions apply. Aħna Refuġjati is organised by the Valletta 2018 Foundation in collaboration with the Floriana Local Council, the Grand Harbour Regeneration Corporation, the Armed Forces of Malta, Transport Malta and Mad About Video. It is part of the Valletta 2018 Cultural Programme.